CLI knows that no matter how good your Freight Management System is, it has little value if you can’t measure what you manage. That’s why that in addition to the hundreds of canned reports that are available, we now offer both your employees and customers dynamic report writers. Either on-line or through the system, anyone who has security clearance, can design, save and run user specific reports on service, sales, operations and financial data quickly and easily without an external report writer OR having to ask your IT department to run a query. Reports get produced instantaneously and most can be shared by email or downloaded to MS Excel. The data is always the most current and can be run easily tailored to meet your specific needs. If this isn’t enough, we welcome you to design your own reports. FACTS™ is fully ‘Open’ and any standard ODBC compliant 3rd party reporting tool may be used to query the tables in the DB. Our current library has hundreds of canned reports for all areas of your operation. Our dynamic reporting tools create reports with only the information needed by the user. Once designed, reports can be saved for future use. Many reports can be scheduled to be sent via email on a specific date and time. 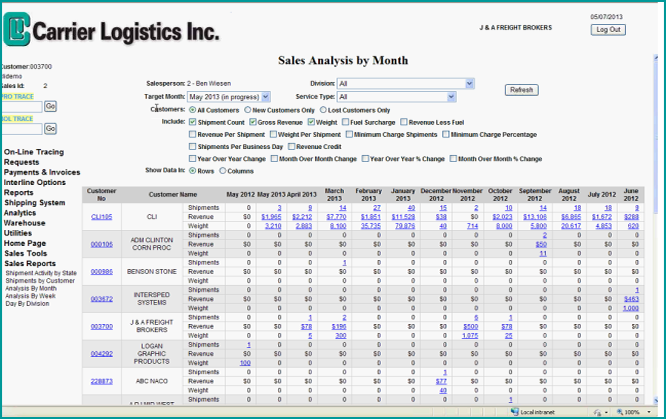 All of our reports can be customized to further meet your specific needs. Keeps your customers plugged into to their business 24/7 over the web. Empowers your employees and sales force by giving them access to their customer’s business. Enhanced analysis leads to better decision making. Most reports can be downloaded to Excel for further massaging. Your Freight Management System has little value if you can’t measure what you manage. Learn more about our dynamic report writers or how our FACTS™ software is fully ‘Open’ by connecting with a CLI representative here, or send an email to sales@carrierlogistics.com.